Over the last week, crews have been preparing University Drive from 4th Avenue N to 12th Avenue N to carry the 10th Street N reconstruction project detour route. A single lane of northbound 10th Street N and southbound University Drive will soon be carried head-to-head on University Drive, which is typically a one-way roadway. 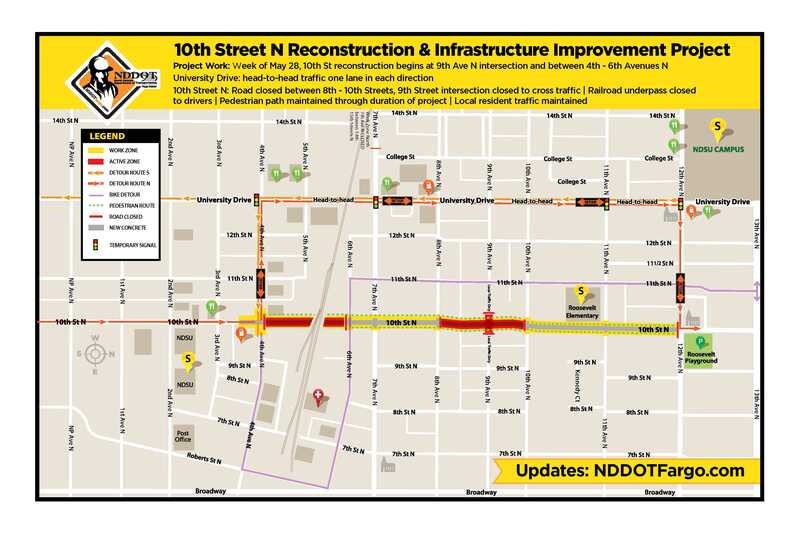 Starting tomorrow, Wednesday, May 30, 10th Street N between 4th Avenue N to 12th Avenue N will be close to thru traffic throughout the duration of the project. All remaining blocks of 10th Street N will be open for local traffic only. The first phase of work will begin north of 8th Avenue N intersection to southside of 10th Avenue intersection. These two blocks and intersection will completely close to all traffic starting the morning of Thursday, May 31. The project work has been designed to split the project limits up into three main phases – the lift station work under the railroad, the stretch from 4th to 9th Avenue and the stretch from 9th to 12th Avenue. This year the North Dakota Department of Transportation (NDDOT) Fargo District and City of Fargo will replace aging infrastructure and continue the city-wide effort to upgrade services for residents and businesses on 10th Street N from 4th Avenue N to 12th Avenue N.
Rear end crashes are the most common in work zones. Motorists are encouraged to slow down, allow extra distance between their vehicles and the vehicle in front of them. Motorists are encouraged to add five extra minutes to their travel plans through the area. Speeds will be reduced on University Drive throughout the project limits.